There was 2 pools available to use. Bed was ok. Our room was upgraded to ocean view for free. Clean big rooms, super friendly staff, very good massage and very good restaurant. Good prices for rooms and meals. Very good flexibility and care from the staff with children. Very quite place. Is possible to watch dolphins by boat. We found the bar with no beer in Bali. I held my 50th bday party there - some of the rooms were great - I got stuck in the back...oh well. Staff were great at rectifying the problem but day after day there was no stock till requested. We held the party using the facilities and we cannot thank the staff enough for the great set up. The swimming pool was empty and thank God there is no work health and safety in Bali cause they would have failed everywhere..... but BEST spa in the whole wide world. The staff were exceptional! Always there to help and very accommodating! Organised a feast for a party of 30+ with no glitches. Large comfy ocean view deluxe suite had really comfy beds and loads of space to chill out and relax. Staff were so accommodating and went out of their way to help us out as a group of 30 staying at the hotel. Perfect venue for a large group sharing a celebration. 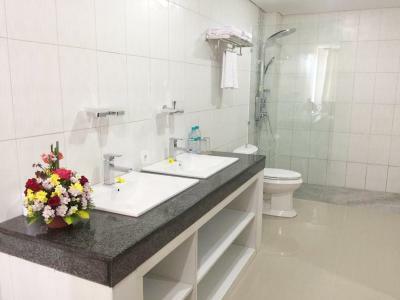 Puri Saron Hotel Baruna Beach Lovina This rating is a reflection of how the property compares to the industry standard when it comes to price, facilities and services available. It's based on a self-evaluation by the property. Use this rating to help choose your stay! Surrounded by tropical gardens near the golden sands of Lovina Beach, Puri Saron Hotel Baruna Beach Lovina features cottage-style and villa-style accommodations and dolphin tour arrangements. The hotel features 3 outdoor pools. The air-conditioned rooms at Puri Saron include private balconies offering views of the grounds or sea. Each room has satellite TV and a fridge with minibar. Private bathrooms provide a hot and cold shower. Guests can enjoy a relaxing massage or simply lounge on the deck by the pool. The hotel provides laundry and dry cleaning services. Room service is also available. 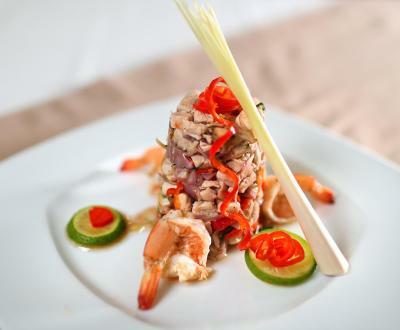 Mawar Saron Restaurant serves a variety of dishes prepared with fresh ingredients. Pool and sea views accompany meals at this beach-side restaurant. Drinks are available at the bar. In Northern Bali, Puri Saron Baruna Beach is just a short drive from the historic city of Singaraja. When would you like to stay at Puri Saron Hotel Baruna Beach Lovina? Overlooking the garden, rooms have a private bathroom with a bathtub and hot/cold a shower. Guests receive 2 bottles of mineral water daily. Decorated in Balinese style, room features a safe and a bathtub. Villas have a balcony, flat-screen TV, sitting area and private bathroom with shower. 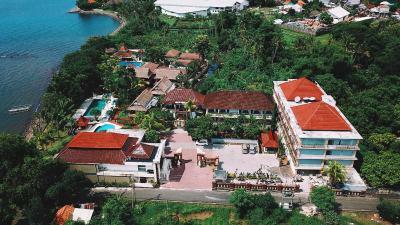 This beach front property will serve you with complete facilities and services. House Rules Puri Saron Hotel Baruna Beach Lovina takes special requests – add in the next step! One older child or adult is charged IDR 145203 per person per night in an extra bed. Puri Saron Hotel Baruna Beach Lovina accepts these cards and reserves the right to temporarily hold an amount prior to arrival. Nothing i think. it's ok for me. There is no sandy beach and good accessibility to the sea (we suggest to built a wooden catwalk to allow so exploit better the sea). The sea was often dirty. The payment method, was not possible to pay by American Express and this created many issue and delay during the check out. Constant construction from 10am to 11pm daily. Workers did their best to work around you and to not disturb you. Restaurant was expensive compared to those around the resort. I would go out to other restaurants to eat all meals. having no pool - no significant beach - terrible WIFI - but enough to live with and relax for five days. The hotel is located around 5km from Lovina town centre and although taxis can be ordered, the hotel might want to invest in a courtesy bus to transport visitors to town and back on an hourly basis.